Coalpits Wash is a good winter hike, but this route is too hot to hike in the summer. Starting early is a must if the plan is to finish the trail in one, short winter day. Many like to do this as a backpacking trip when other backpacks in Zion are closed due to snow. Day Hike: Yes, but often done as a backpack. The trail can be difficult to finish on the short winter days. Camping: Stay at least .25 miles from springs and stay out of site of the trail. Do not camp near the trailhead. Camp at previously used sites or slickrock to reduced impact. There are several areas after the oil remnant site for camping. A permit is required for camping. Trail Usage: The trail gets low use most of the year, but in the winter when other backpacks are closed for ice or snow then this trail can get several hikers on it. Pack Trail: Yes, pack animals are allowed with restrictions. Difficulty: Moderate, with little elevation chang. The trail is long trail and route finding skills are required. This is a good route for runners unless someone has hiked it while wet and its full of pot holes. Sun Exposure: This trail is not recommended during the hot days of summer due to the low elevation and exposure to full sun. Trail Conditions: This is a dirt path with some stream crossing and simple bouldering. Trailhead: 7.3 miles south of the south entrance gate. Look for the Coalpits Wash sign. Turn off on the right side of the road and park in the flat area. 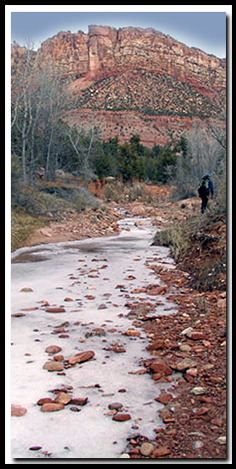 Trail Access: The trail is located just off highway 9, outside the main section of Zion National park, on the far south side. Best Season: Avoid this trail in the summer due to the low elevation and full sun. This is a good winter hike but most hikers will not be able to make it to the end of the trail and back in winter daylight. Restrooms: None. Pack out all trash including toilet paper. There is a unique collection of historic oil artifacts along this hike, which seem odd to stumble upon when hiking in Zion National Park. The rusted old metal is left over from the 1800s, before the area was included as part of the Mukuntuweap National Monument and later Zion National Park. The oil well artifacts are found at mileage 5.23 with about 1.5 miles left in the hike. The tributary past the rusty metal remnants is Jennings Wash. Two other un-named tributary washes enter from the south. Waterfalls, when present, are more abundant near the canyon's end. The Bishopric, Towers of the Virgin and the Altar of Sacrifice are visible in the last couple of miles of this hike. The Coalpits trail follows a stream. 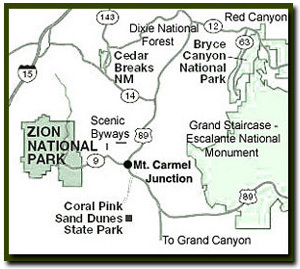 This desert trail is the lowest point in Zion National park at 3666'. The trail traverses a pinyon-juniper desertscape along the Coalpits drainage near the base of the Cougar Mountain wilderness area. Huber Wash, Scoggins and Coalpits Wash are all drainage's that confluence with the Virgin River and are located in the same general area. The Coalpits Trail runs along a fairly reliable water drainage for the length of the hike. Coalpits does occasionally dry up during the summer. Although the start of the trail is far out of the main section of the park and leads through sagebrush, power lines and often muddy passages, the later part of the hike is charming with nice waterfalls. Watch for petrified wood. Along the first 2-miles of the route watch for basalt rock formations. Basaltic lava broke through faults damming the Coalpits Wash long ago, leaving behind a cinder cone, Crater Hill, as evidence of the last eruption there. Crater Hill is not visible from this hike, but two other basalt covered mountain are. One is prior to the Coalpits and Scoggins confluence and the other is located across from the junction. Drive 7.3 miles past the parks south toll booth, past Springdale and past Rockville. Look for the small sign labeling the Coalpits Wash, just past Huber Wash. Turn off the road there and park in the flat dirt area. The trailhead is north of the parking area. The Scoggins Trail and Coalpits trail share the same trailhead. The elevation is 3666'. Begin by locating the well traveled dirt path. The water flow is to the left and becomes distant during some parts of the initial trail. Continue down the path past the power lines, around the sagebrush and through the ditches. Soon black basalt rock will become evident, up high, on the left. The trail passes closer to low rock formations on the right, now distant from the water. The moenkopi formation can be seen up high on the left. Before long the trail begins to meander closer to the water. Some small waterfalls and large boulders add interest to the otherwise barren landscape. A few interesting conglomerates are present, made up of stones that have been cemented together by nature. This junction is directly in front of the second basalt mountain. There is a large tree between the two washes where they separate. At the Coalpits and Scoggins Wash confluence, follow the path (left) west. This junction is 1.3 miles into the hike. The next section of the trail becomes more interesting. There are larger boulders along the water and stream crossing to find a path to walk along the wash. Coalpits has a more reliable water source, compared to Scoggins, making it a more enjoyable trail when the water is not flowing in Scoggins. The wash narrows and the elevation increases slightly from 3794' at the confluence of Scoggins and Coalpits to 4407' at the Chinle and Coalpits junction. It will take 3-4 hours to reach this point. Evergreens brighten the path during a winter hike. The West Temple is evident bordering the edge of the main section of Zion National Park as well as the Towers of the Virgin, Altar of Sacrifice and the Bishopric. Cougar Mountain has been in view to the north during much of the hike. Rattlesnakes are common along this trail during the hotter months of the year. At the 90 degree bend, where the big boulders line the edges, is a cougars den. Cougar prints are common along the trail. Do not hike the trail when it's wet. Many of the areas are clay and hikers sink into the mud making it a difficult hike and very difficult for those that hike in your dried tracks. (When hiking from Chinle or Scoggins up to the Old Stock Trail, the area is heavy with clay.) The trail was named for the basalt rock on the first part of the trail that resemble coal. Exploration of the Chinle Trail, Scoggins Wash or Huber Wash.